Thanks for visiting the home page of the Sierra Contra Dance Society, located in Reno, Nevada. Contra dancing is an old dance form combining elements of line and square dancing, done to 8/8 music. 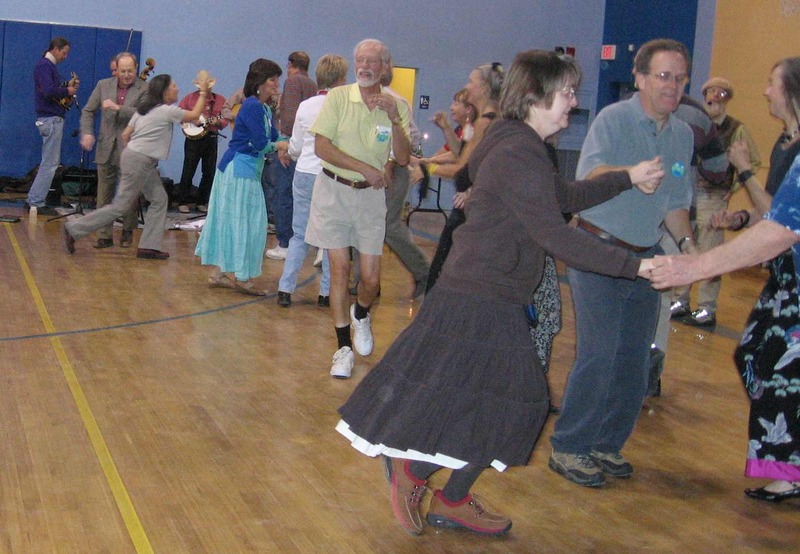 Contra dancing is fun, sociable, aerobic, and is always done to LIVE music! Check out our photos with the Photos link on the left and also other sites under Links showing real clips of contra dancing. We have recently added links to a great series of instructional videos on contra dancing. We now have a page at Meetup; please feel free to check it out! Click here to watch a two-minute excerpt of our May 2014 dance! Your membership in SCDS is important to our continued stability. Click here for the 2018-2019 membership form and renew or join today. We reduced the membership fee to $20 to draw more members this year. Please note that all our events are alcohol-free and nut-free due to some of our regular members having nut allergies. Snacks are always welcome, but if you bring any, please ensure they do not contain nuts of any kind. It's that time again - time for our annual cross-group dance get-together in Truckee! This time it's going to be located in the Veterans Memorial Building on High St in Truckee. Saturday, June 29 from 7:30pm to 10:30pm (beginner's orientation at 7:15). Click here to see this year's flyer for the event. WHERE: For the April & May dances, we will be meeting at the Evelyn Mount Northeast Community Center, 1301 Valley Rd., Reno NV. We hope to announce a new "permanant" home soon. The dance fee is $10.00, but SCDS members get a $2.00 discount. New to contra dancing? Please come at 7:15 PM for a beginners' session.